The Byrne family lost Kato and Pippa after 12/13 years. Maria says that she had a special bond with Pippa who would follow her everywhere. Katy was adorable, a little nervous, but loved everyone he met – just wanting petting. Bella – their new dog – they describe as adorable, a very loving little dog who is settling well. She is a quick learner and eager to please. 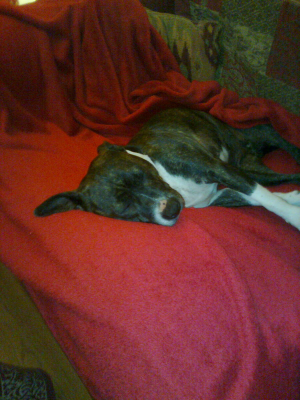 The picture shows Bella has definitely made herself “at home”!